Tyler Houston learned to hit, it just took him a while, he told The Spartanburg Herald-Journal. Once he did learn to hit, it finally got him to the majors. "I learned how to hit last year," Houston told The Herald-Journal in spring 1996. "I'm sure I could come up with a bunch of excuses why it didn't happen sooner, but I guess it took me that long to figure it out." For Houston, the second overall pick in the 1989 draft, hitting was supposed to come easier and sooner. Houston, a catcher from Las Vegas, was taken that year by the Braves, getting a signing bonus that topped $232,000, described as the biggest in league history to that point. 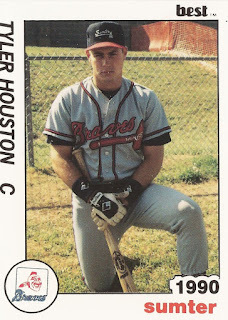 Houston played that year at rookie league Idaho Falls, hitting .244 with four home runs. 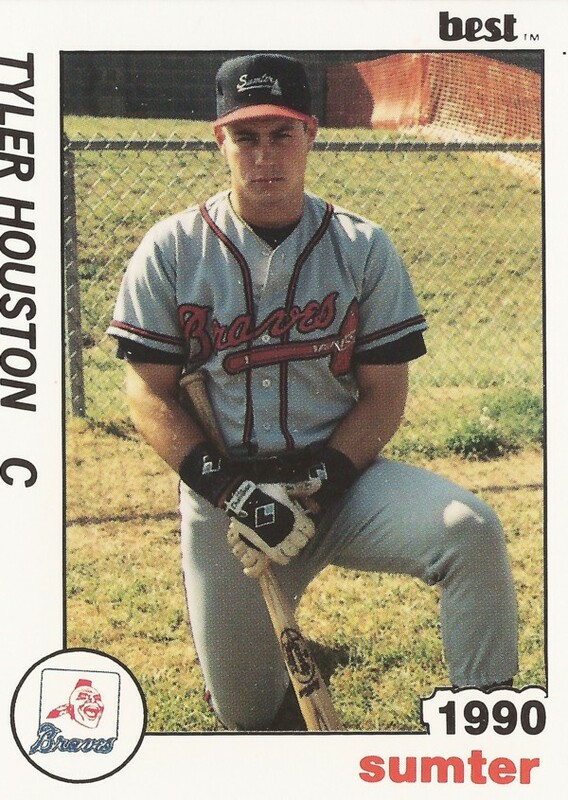 He made single-A Sumter in 1989, hitting 13 home runs, but his average dropped to just .210. "Learning to be a catcher takes a lot out of you," Houston told The Charleston Post-Courier in June 1990, "and then you have to go up and hit. I know I'm better than a .220 hitter, but it will come along. I'm making good progress." Houston stayed in single-A and high-A through 1992. He made AA in 1993, hitting .279 on the year, and made AAA for good in 1994. Then, finally, in late March 1996, Houston got the news he'd been waiting for. "I talked to my wife and family and they're ecstatic, but it hasn't registered with me yet," Houston told The Associated Press after he got the news. Used mainly in a pinch-hitting role, Houston hit .317 on the year, splitting the year between Atlanta and Chicago, traded mid-year. He also hit three home runs and knocked in 27 runs. In a June game, Houston, still with the Braves, came in with the bases loaded. He missed the first two fastballs then hit the next one down the line for a bases-clearing triple. "I made a little adjustment and was able to hit that third one," Houston told reporters afterward. With the Cubs, Houston returned for 1997, 1998 and 1999. In July 1998, Houston hit two home runs in one game, out of nine hit on the year. He did that one better in July 2000 with Milwaukee, hitting three in one game against the Tigers. "The two previous nights, I was terrible and felt terrible," Houston told reporters afterward. "I was seeing the ball well. The fourth at-bat, I was a little anxious." Despite the slow start, Houston went on to a major league career that spanned eight seasons, his final one in 2003 with the Phillies. He split the year before between Milwaukee and Los Angeles. With the Dodgers, Houston made his debut with four hits, against the bitter Dodger rival the Giants. He also learned a few things about himself from the helpful fans in San Francisco, according to The Los Angeles Times. "That was a lot of fun," Houston told The Times. "It was fun enough being part of the Dodgers, but it was nice to be part of a great rivalry, to be yelled at and told I stink."